So finally a new phone from One Plus Chinese company has been released today and widely available in the market. According to the rumors, this Chinese beast is an iPhone X killer. The Oneplus 6 for the first time and it manages to pack in a whole lot of specs with a high-end design and one of the most important things about this phone are very affordable as compared to iPhone X and other flagship phones. But how does it compare to one of the most expensive and popular devices on the market? The iPhone X sits in our best phone list right now, but it's going to cost you a lot of money if you decide to buy it. So we'vs wrote down some specs, design, and price which helps you to decide which one is better and is that really One plus 6 is an iPhone X killer. Next thing is that OnePlus 6 is bigger than iPhone X it has 6.28 huge AMOLED display with 1080x2280px resolution and iPhone X got Super AMOLED 5.8 inches with 1125x2436 pixels resolution due to the larger screen size OnePlus 6 is heavier than iPhone X weight of OnePlus 6 is 177g and iPhone is 174g just a minor difference b/w both devices. Each has a high-end, premium-feel design with both being the most attractive products from each of the respective companies. The notch is at the top of the screen on both devices, but on the OnePlus 6 you can hide it within the settings on the phone so it blacks out the bits to the side of the notch at the top of the screen. 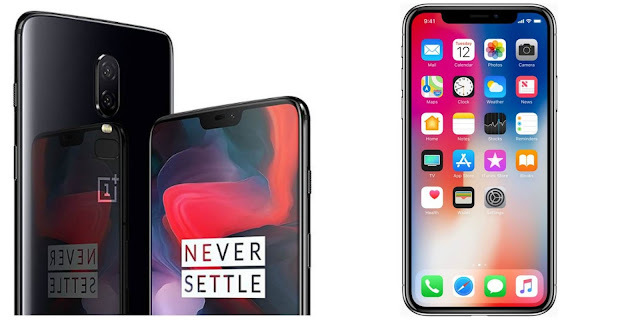 As we know that OnePlus has a larger screen so there are fewer pixels per inch as compared to iPhone X while iPhone X screen has better display resolution. OnePlus 6 comes running the latest Android 8.1 Oreo software with the company's own Oxygen OS UI running over the top. It looks top-end and you can expect OnePlus to support OS updates for this phone for at least a couple of years.OnePlus 6 got Qualcomm Snapdragon 845 processor, which we've seen inside a lot of flagship phones this year and it has impressed us. That's paired with either 6GB or 8GB of RAM, depending on which version of the phone you go for. If you bought 128/256 GB version you got 8GB of RAm and else if you bought the 64GB version you got 6GB of RAM. OnePlus 6 comes with a dual sensor 16MP and 20MP working together to take photos. Both of those are f/1.7 and can record a variety of video including 120fps slow motion at 720p. On the front of the phone is a 16MP (f/2.0) selfie camera. While iPhone has a dual-sensor rear camera that's a 12MP sensor with an aperture of f/1.8 and another 12MP with f/2.4 aperture too. Those are used for a variety of modes including a 2 x optical zoom. 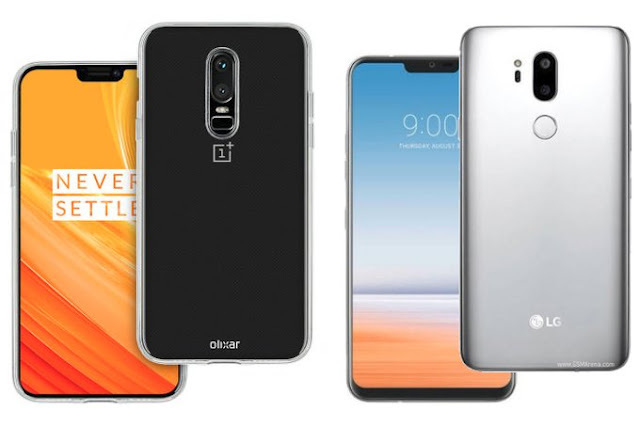 The feature of Optical zoom is not available in OnePlus 6. So OnePlus 6 are available in the market now the Price starts at $529 / £469 (about AU$700) for the cheapest version and the most expensive costs $629 / £569 (about AU$840). iPhone X are already selling in the market, price starts at $999 / £999 / AU$1,579 for the 64GB one, while the 256GB one is much more expensive at $1,149 / £1,149 / AU$1,829.